If you’re a surfer or diver you should be chipping in for this beautiful creature. They’re not man-eaters. We want to get this clear from the start. They are actually really very placid. In fact, its because people used to think they were man-eaters that they are on the edge of extinction now. In the 1950’s they were hunted, leaving as few as 1,500 on Australia’s east coast. It was probably because they were hunted so much that grey nurse sharks were the first protected sharks in the world, when they were protected under New South Wales legislation in 1984. There are two populations of grey nurse sharks in Australia. The east coast population (the one we’re helping out with Edge Pledge) lives along the coast of New South Wales and southern Queensland. The west coast population is lives around the south-west coastal waters of Western Australia. Grey nurse sharks mainly just chill out on the sea bed, in rocky caves or around reefs and islands. They are more active at night, when they eat most types of fish, squid and crayfish. And they even add a few other sharks into their menu to keep up the variety. Male sharks start mating around age four; females need a few more years before they can breed. Both males and females can reach the whopping length of 3.6m. That’s the nearly length of your car! Pups measure an average of 1m in length at birth. That’s a big baby! They are pretty ruthless from birth; within the female shark’s uterus, the more fully developed babies eat the less developed embryos and unfertilised eggs. As a result, only two pups are produced per litter. Grey Nurse Sharks breed only once every two years. This is the lowest reproductive rate of any shark which is probably another factor that has put them on the edge of extinction. Although the sharks are protected today, they were commercially fished quite extensively in the past. Illegal fishing still occurs. 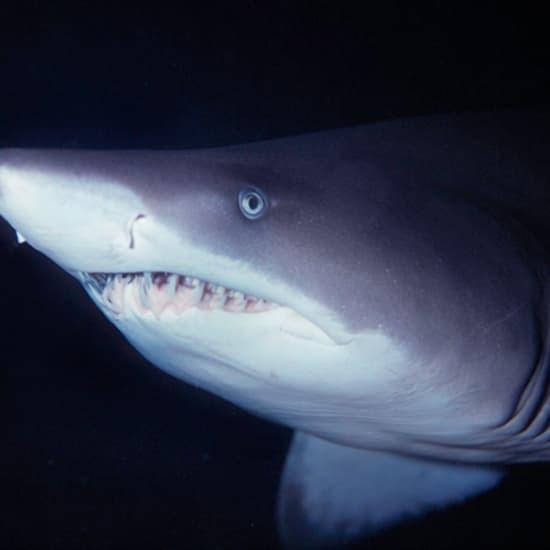 The places that the shark love to hang out are also places that people love to go fishing, so there have been reports of recreational fishers accidentally catching Grey Nurse Sharks. Scuba divers have seen a large number of the sharks with hooks and lines in their mouths. Some survive the injuries they sustain from fishing gear, but many don't. Beach safety nets, designed to keep out sharks that are dangerous to humans, can also trap the Grey Nurse Shark. We need to know more about the Grey Nurse Shark. Increasing our knowledge of all the different impacts on Grey Nurse Shark enables us to develop better policies and management practices when it comes to improving the future of this majestic species. We need funding to keep a track of their movements. To do this we need to tag sharks and also setup sites to detect their movements (acoustic receivers). We will deploy, test and retrieve acoustic receivers at Wolf Rock, the only known gestation site for grey nurse sharks along the east coast of Australia. This will then enable us to acoustically tag Grey Nurse Sharks which will provide invaluable data for us to then decide the best ways to protect them. $10,000: will can deploy, monitor and analyse 3 listening stations and 10 acoustic tags. $50,000: will can deploy, monitor and analyse 10 listening stations, 60 acoustic tags, and complete recreational diver surveys to understand what they have seen. $100,000+: We will expand our monitoring to other priority Grey Nurse Shark sites to continue to build our knowledge. SEA LIFE Trust with Underwater World SEA LIFE Aquarium, University of Queensland and Queensland Parks and Wildlife Service, Environment and Heritage Protection. Donate directly to Sea Life Trust.